the stylish, yet classic handbags that have become Free Endearment. Morse’s influences are broad, but the line remains personal – many of her bags are designed with particular friends and family in mind and are named accordingly. With Free Endearment, Morse seeks to provide strong independent women with handbags that can be worn at any age and occasion. Free Endearment is truly a labor of love. Free Endearment : If you aren't afraid of getting a little attention while strutting down the street, Free Endearment is the brand for you. We've designed our bags to be practical enough for every day use but unique enough to turn some heads. They are all handmade from custom tanned leather and quality hardware and lining. With such a variety of sizes, shapes and colors, we challenge you not to fall in love with at least one. Matt from Free Endearment Sent me the Luanne Wallet in Mustard of the soon to release SS12 Collection (Thank you so much Matt!) 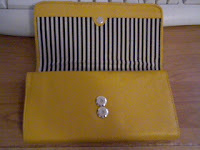 This bold colored yet chic' wallet screams my name. It's bold front pattern is sophisticated but also wants to party. It can go from the office in your over sized tote, to the night life of romantic dinners to the clubs as a wallet clutch. You will be having women commenting on it and demanding where you bought it. They cant resist but to stare as you walk away. (Smiles). If you have read any of my other post you will know that I'm a big purse fan. If I had to pick between purses or shoes for the rest of my life, I would go barefoot in the snow. 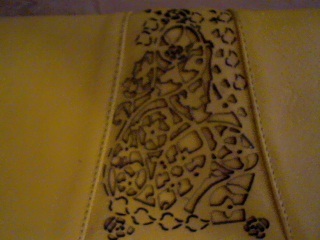 I love..love..love the front design on my Luanne Wallet, I have seen all different shapes, colors, and designs on purses and wallet's before. But this one blew my mind. (In a good way) .. The different designs is amazing, you have flowers, and clovers, and little roses, and shapes. This will be a great talk about piece at parties because your female friends will have never seen anything like this. Unless they are a big fan of Free Endearment (Wink) My husband loved the design, and he is a very, very picky purse/wallet liker. He said that the color is really nice and he loves the design. He said it looks burned on. (In a good way) For him to say that.. The wallet is a great piece to add to my collection. I love the bold black and white print pattern inside the wallet, it mates with the creamy mustard color so perfectly.The double magnetic closure is great for me because I can shorten it or give it length when I need a little extra oomph for my extra packed weeks and weekends. Wait..There's more!.. This baby has everything. As you can see the top inner part has a cash department, a change compartment, and six (6) credit card/debit card slots! And I'm just getting started. I have to carry around alot of plastic. 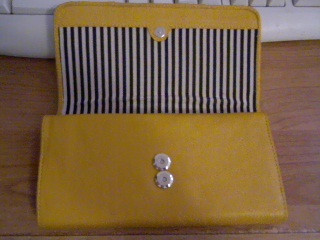 Such as G.C's, insurance cards, debit cards, business cards, store club cards, Ect. 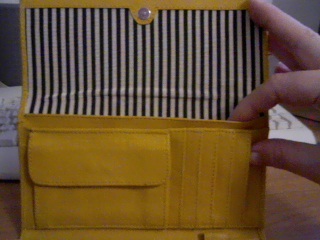 I need alot of card slots and this wallet has it plus more! I love you Free Endearment! Do you see that?.. Yup you guess right..Yet another cash compartment. Now for me to get money to put in those cash departments..(Laughs).. Do you see that also?..A secret zip compartment. I call those my ..Hide money from my husband stashes. Every woman needs one. And even a loop hook for your favorite pen's. 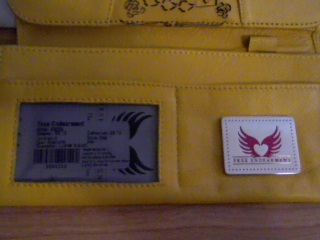 I love wallets that have those because the purse elves always steal mine. More compartment..or as I like to call them, my hideaways. All the wallets I have ever had the ID/Drivers license were always plastic. And I hate that feature. Most of them are hard plastic and I struggle to get my Id out, or the plastic rips and I have to cut out the plastic to be able to use it. This wallet is a sturdy mesh I love this feature. For one I never had a wallet that has a screen mesh and 2 it's a unique feature. 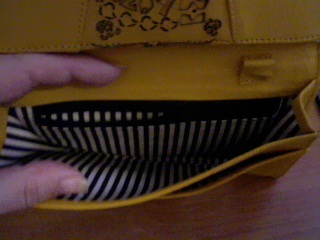 the compartment beside it has the most cute logo EVER, Free Endearment's logo. The studded logo heart and wings gives it that cuteness factor. 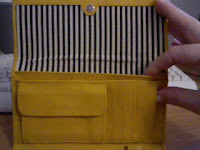 Can you say "Another cash cubby"..
You probably thought I was done with the wallet compartment's..Right?..Wrong! 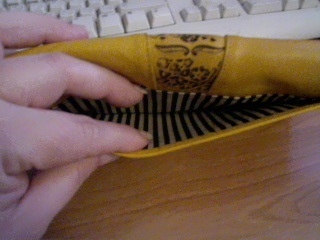 I am thrilled to say Free Endearment has packed another compartment into this wallet. I know..I'm as shocked as you are! They are some miracle workers. I have never had so many compartment's in one wallet! ..Not complaining what so ever..But how did they do it?.. I have officially found where I will be buying the rest of my wallets and purses. So should You! Free Endearment has other amazing assortment of colors, shapes and sizes in the new SS12 Collection such as the ones in the photo. I'm in love with the pink one in this photo! (Angel's plays harps).. I'm not a big fan of the color of mustard. 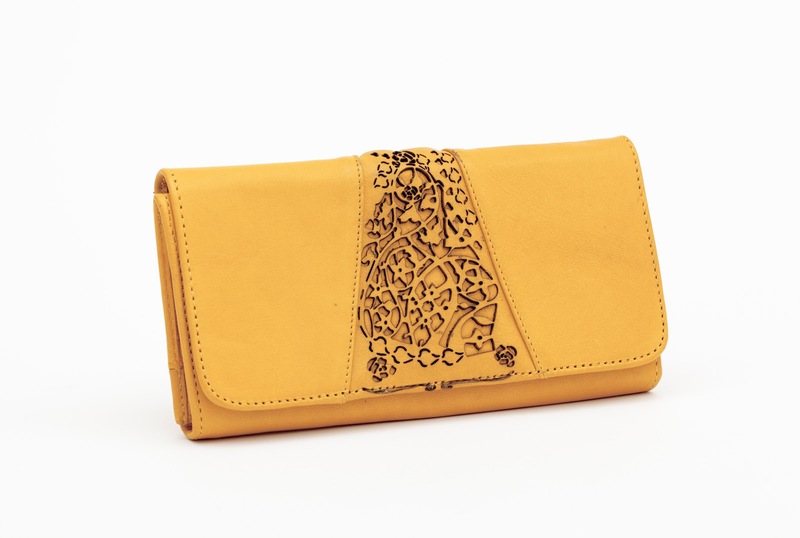 But for me to brag about Luanne Wallet in Mustard. Free Endearment has to be doing something right! Because I love it! .. Even my husband said he loved everything about it. (Shocked). 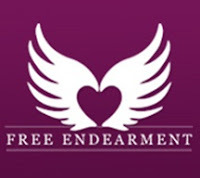 If you loved the Luanne Wallet, Besure to check out all the other collections Free Endearment has to offer. I have a couple of favorites in the collections I would love to get my hands on, such as Jessica Jessica (Black or Pink) , Luanne (Black or Pink) , Courtnee (Black) , and last but not least, Kristina (Black) . ♥ You can find Free Endearment on Facebook - Free Endearment Facebook. ♥ You can find Free Endearment on Twitter - Free Endearment Twitter. ♥ I received no monetary compensation for this review. I was provided a Free Endearment wallet to try and give my honest opinion(s).